Ever since the bear market of 2018 started losing its strength, EOS has been showing signs of recovery. The coin reached its lowest point after the mid-November market drop, sinking deeper and deeper until it reached $1.70 on December 8th. This was its lowest point in the past 16 months, and from then on, EOS kept growing, albeit slowly and with a number of obstacles to face. 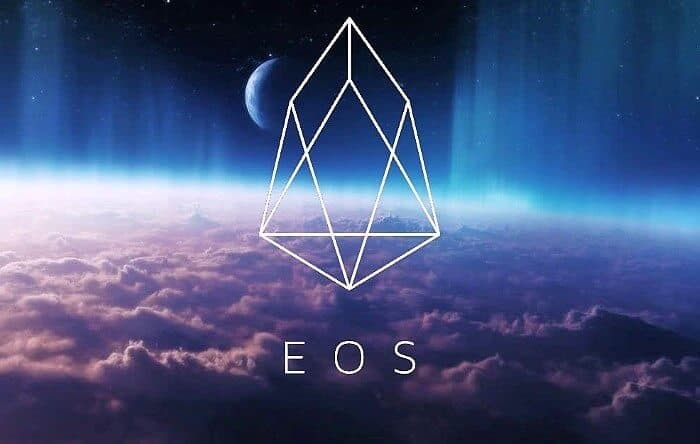 However, in the past four months, EOS price managed to grow by over 200%, currently sitting at $3.75. 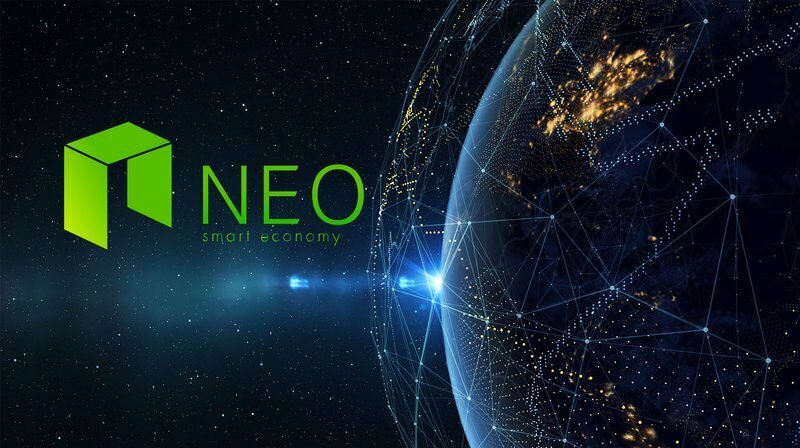 This allowed EOS to remain among the top 10 cryptocurrencies by market cap, with its own market cap being at $3.39 billion. It is positioned as the 5th largest coin right now, still bested by Litecoin, XRP, Ethereum, and Bitcoin. Meanwhile, EOS also remains among the coins with the highest daily trading volume, currently being at $1.32 billion, which is more than twice the size of XRP’s current volume, which is at $618 million. This indicates that this is still a very popular coin and that people are more than willing to buy EOS. As mentioned, after the November market crash ended, EOS was at the lowest it has been in a long time. However, it did not stay there for long, and as soon as the bear market started losing its strength, EOS price took an opportunity to surge. By December 18th, it managed to breach the resistance at $2.40 and turn it into a strong support which already saved it from sinking several times. The period between mid-December and mid-January was marked by multiple attempts at growth, with the price of EOS trying to breach another strong resistance at $2.70. Unfortunately, the bears renewed their strength and struck again around January 10th, taking EOS down to the previously mentioned support at $2.40. EOS remained here for an entire month until February 8th brought a series of smaller bull runs that affected the entire market. The first one to arrive took the coin back to the $2.70 resistance, which the coin soon managed to breach, but it did not venture far beyond it for the next ten days. On February 18th, however, a much stronger bull run took it past this level, and it even broke the next resistance at $3.20 with ease. It was only stopped after it climbed all the way up to $4, and it even broke this roadblock on February 23rd, when the last and strongest bull run struck. On this occasion, EOS price hit $4.40. However, it was not to last, as the bulls suddenly withdrew, and were replaced by bears, which took the coin down to $3.60 mark. This was another support which stopped the drop for long enough for the bearish market to lose its energy. However, it resulted in the support being broken, and it has been acting as a resistance for the following two weeks. On March 4th, the market saw another drop, and EOS dropped as well, hitting the support at $3.20. The price recovered rather quickly, however, and EOS climbed back up, even breaching the resistance at $3.60 once again. 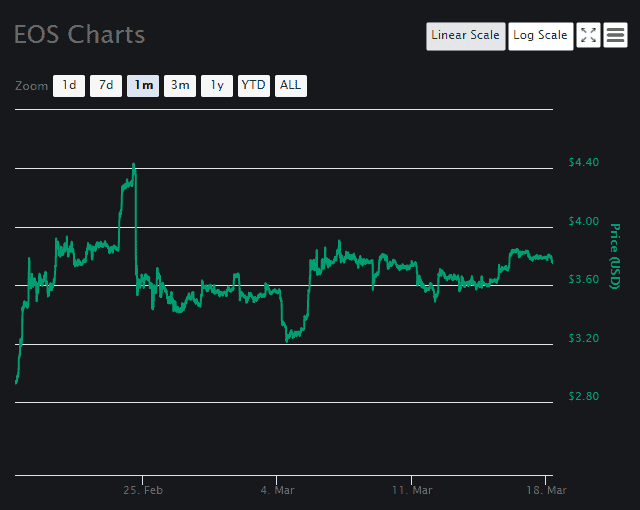 This was two weeks ago, on March 5th, and the coin has been relatively stable since then, mostly fluctuating between $3.60 and $3.70. 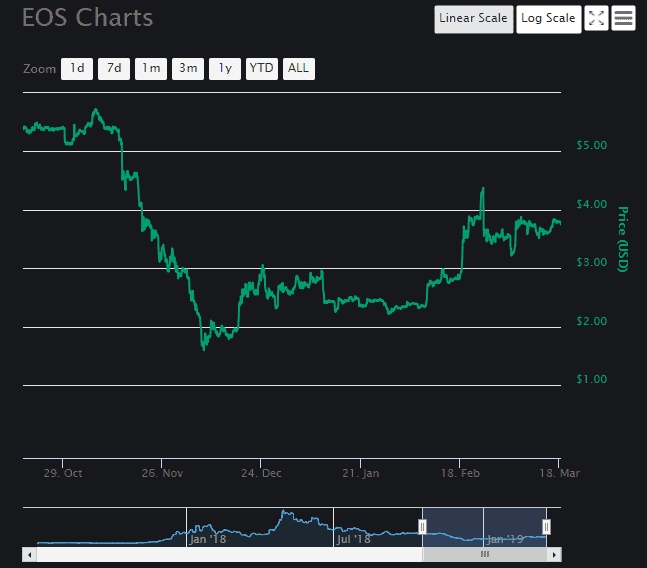 During this weekend, EOS even grew a bit, climbing up to $3.84, and discovering that it cannot grow past this resistance. It did stay quite close to it, however, waiting for another bull run which would take it past the newly-found barrier. If one such event does occur in following days, EOS will likely breach the $3.84 resistance, and grow further up, likely hitting $4.00 mark, and potentially even passing it. In that case, this level would become new major support, which would hold EOS while it attempts to grow even further up. However, that remains to be seen, and the coin’s future depends on market behavior. 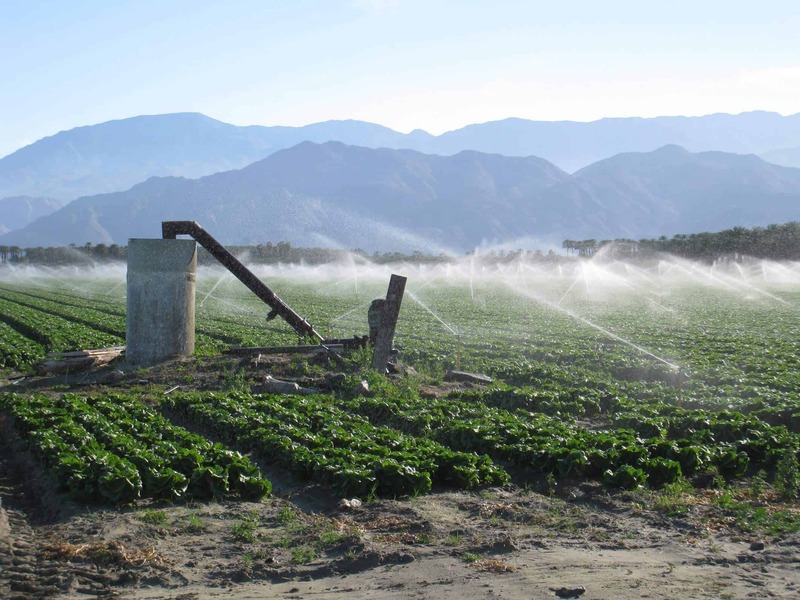 The will to grow is still quite noticeable, which makes this a perfect time to buy EOS.